Reks dropped his debut album Along Came The Chosen back in 2001 when the indie scene wasn't as stale as it can be now and then it seemed like he just disappeared. That was until earlier this year when he dropped Grey Hairs. An early contender for indie album of the year. Though the bulk of Grey Hairs is produced by Statik Selektah, Reks gets a chance to prove his lyricism over the beats of legendary producers DJ Premier and Large Professor. The guest features on Grey Hairs are sparse, yet they all add to the album. The rapper spits alongside Consequence and Termanology on “Premonition,” as the trio speaks about their decisions to change their lives for the better. As an ode to his mm, Reks draws an inspirational picture on “Cry Baby.” Over a soft soul-sampled melody, he revisits how his mum overcame many adversities, including her drug addictions and his incessant failure to help. You can’t help but feel sympathy for her this track also highlights Reks’ story telling abilities. At 19 tracks, the album inevitably has a some filler. But even on these, Reks puts his undeniable skils on display, something lacking from most albums these days. 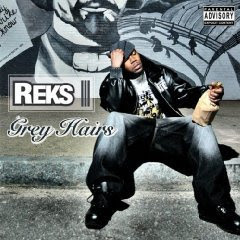 Reks Is'nt someone to rest on his laurels and has already let loose with a dope Premier produced track that serves as the first single off the next album, More Grey Hairs. Check the flava below, another dope premier production.